The days of a wedding album consisting of static, old fashioned, posed wedding photographs is gone. 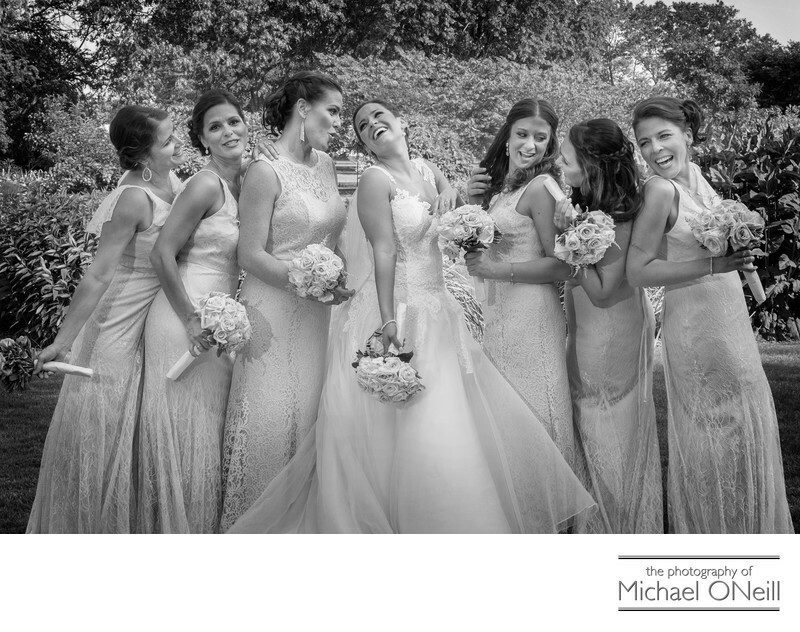 Today’s bride wants emotion in her photographs…often loose, casual, spontaneous pictures that capture the true essence of her personality and those of her friends, family and bridal attendants. As a professional wedding photographer I am always called upon to take "fun wedding party pictures". Often times the bride and groom have no particular idea in mind for those images. Sometimes we’ll create funny scenes such as the bride fighting over the groom with the groomsmen. More often than not these contrived images come off looking silly when viewed later on. An image such as this one pictured here is what most brides seem to want me to capture these days. The laughter, the friendship, the camaraderie…the casual interaction between the bride and her bridesmaids…girls that are usually the closest friends the bride has in her life. Shots like this are very simple to capture. I normally dotes immediately after taking a more formal, posed shot and then just encourage the girls to laugh it up, interact with each other and try to forget that the camera is even there. The black and white treatment of this pic also lends to it’s casual appearance by giving it a more realistic photojournalistic feel. Without the distraction of color the viewer’s eyes are drawn into the moment…into the interaction between the bride and her bridal attendants. Your finished wedding album should include photographs like this that capture the spirit and emotion of the participants and will also; ideally; showcase classically posed portraits that captures everyone’s beauty.